Properly directing rain and melted snow off your roof helps to keep water away from your foundation and from seeping underneath your shingles and behind the siding. Ply Gem offers long lasting seamless gutters, gutter protection, and strong, supportive gutter hangers to protect your home and eliminate the need for constant gutter cleaning. 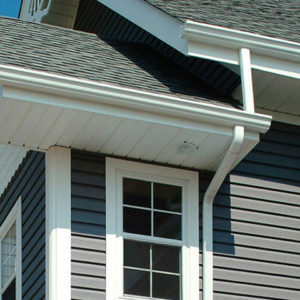 Best of all, Ply Gem’s gutters come in dozens of colors to coordinate with your home’s exterior. The strongest gutter system available for residential construction, Sectional Gutters are made from the highest quality aluminum. Ply Gem’s patented free-floating hanging system coupled with engineered expansion joints ensure the gutters hold tight even as they expand and contract with changing temperatures. *Due to screen resolution limitations, product colors may not be exactly as shown. Leaf Smart features a specially designed steel mesh screen that blocks leaves and debris from clogging your gutters.